Many years ago, during Advanced Waterjet Cutting's infancy, we were awarded a long-term contract to cut near net shape parts from 1 ¼" to 1 ¾" thick titanium bars. The original method for making this part was to machine a titanium bar into shape that is only a fraction the size of the original bar. With the waterjet cutting process, we are able to cut TWO near net shape parts from the same titanium bar that previously yielded only one part. And, the two waterjet cut blanks required far less machining to complete. Hence, Advanced Waterjet yields twice as many parts from the same material and saves nearly 70% of the original CNC machine time. We cut thousands of those parts, saving the customer tremendous amounts of money - converting cost savings to profits. Advanced Waterjet Cutting has assisted hundreds of machine shops, fabricators, manufacturers, sheet metal shops and other industry types by expanding their capabilities with the utilization of waterjet technology. We give further assistance by supplying enormous cutting capacity (in both material size and piece part volume), and we maintain stock on a wide variety of material types and thicknesses (e.g. stainless steel, aluminum, carbon steel, rubber plastic, glass, etc.). Additionally, we can furnish secondary and turnkey operations when necessary to meet the customer's needs. 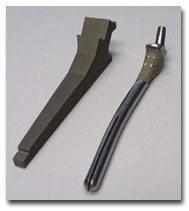 Are you in a situation where Advanced Waterjet Cutting might assist you? Have you ever considered using the waterjet cutting process and analyzed its cost savings potential? Let us help you. We have been in the business for over 15 years and have a staff that can meet your every need, from engineering, CAD and planning, to waterjet cut blanks for machining or the finished part ready to ship. Call us, fax us, or e-mail us today with your questions, request for quote, or your order. Copyright © 2001 Advanced Waterjet Cutting. All Rights Reserved.